Set up an international platform to share data and experiences, and coordinate industrial policies and trade to conserve resources and energy, urge Yong Geng, Joseph Sarkis and Raimund Bleischwitz. Yong Geng is professor and dean at the School of Environmental Science and Engineering and deputy director of the China Institute of Urban Governance, Shanghai Jiao Tong University; and an adjunct professor at the Shanghai Institute of Pollution Control and Ecological Security, Shanghai, China. Joseph Sarkis is professor of management at the Worcester Polytechnic Institute, Worcester, Massachusetts, USA; and a research fellow at the Hanken School of Economics, Helsinki, Finland. Raimund Bleischwitz is chair in sustainable global resources at the Institute for Sustainable Resources and director at the Bartlett School of Environment, Energy and Resources, University College London, UK. Industry must rethink its approach to resources. Manufacturing is wasteful. It takes a tonne of metal, silicon and plastic to produce a laptop computer weighing a few kilograms. Waste is an afterthought. Each year, 8 million tonnes of plastic are dumped into the oceans. Greenhouse-gas emissions are out of control. Producing cement releases as much carbon dioxide into the atmosphere each year as Europe’s 300 million cars: 1.5 billion tonnes1. Water is squandered — we calculate that it takes 1,250 litres of water to grow 1 kilogram of rice in China. Global demand for resources is projected to double by 20502. Viable supplies of rare metals, such as lanthanum and yttrium, could run out. Carbon budgets would be blown and biodiversity ravaged. Clearly, resources need to be managed more sustainably. Just 6% of materials are recycled3. This is surprisingly little, given the potential savings. Reprocessing aluminium takes a fraction of the energy needed to extract the metal from its ore4. Products made from reworked plastics are around 80% cheaper than those using new materials if the costs of collecting, sorting and processing are kept low. New revenue streams open up from materials that would otherwise be discarded, and disposal costs are avoided. A handful of nations are embracing this approach. 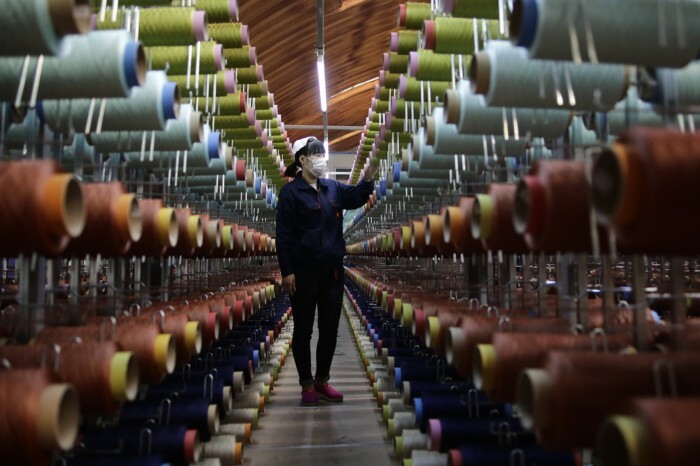 For the past 20 years, China and South Korea have operated industrial parks that use the principles of circular economy to link the supply chains of companies and reuse or recycle common materials. China has certified more than 50 such parks. The European Union and Japan have legislated on eco-design, made producers responsible for the after-use of their products and boosted markets for secondary materials. Some US states and companies have set up networks for sharing and recycling resources5. Brazil and India use informal recycling systems. But the sum of all these efforts remains paltry. Projects operate in isolation and have not shifted the behemoths of global industry. We call for a global initiative to advance the circular economy. It should be led by the United Nations and involve G20 countries, the World Economic Forum, industry and citizen-oriented organizations. It should gather data, draw lessons, trigger learning and share experiences on how businesses and people use and recycle resources. Policies, missions and incentives should be developed to spread circular-economy practices worldwide. The circular economy operates on four levels: products, companies, networks and policies. First, products need to be designed to be recyclable and reusable, based on green supply chains and manufactured using clean methods. Second, companies need new business models to create private and public value. Third, networks of companies and customers that produce and consume key products, such as cars, need to be linked. Fourth, policies are needed to support markets. Sustainable materials, especially biomaterials, are key. For instance, biomass can be used as a chemical feedstock for products or packaging, or might be burnt or turned into fuels for transport, heat and electricity6. Plastics must be recyclable: polymer production worldwide releases 400 million tonnes of greenhouse gases a year7. China’s circular-economy industrial parks saved 14 million tonnes of greenhouse gases in 2016 by recycling plastics, equivalent to taking more than 3 million cars off the road8. New markets and business models emerge. For instance, a copper-smelting plant might recycle old wires and components as well as extract metal from minerals. Vehicle manufacturers might take back cars and upgrade parts so that they run for longer. When a car reaches the end of its useful life, it could be dismantled and its metals and plastics used to make other products. Customers could access mobility services rather than purchase cars. China, Japan and South Korea have national strategies for enabling the circular economy. In 2008, China approved its law to reduce, reuse and recycle municipal waste and industrial by-products. The government has invested billions of yuan in demonstration projects, deployed tax incentives and issued permits that allow industry to pursue activities that were previously banned, such as selling relatively clean waste water (‘grey water’). Extending such practices would save Chinese businesses and households 32 trillion yuan (US$4.6 trillion) in 2030, or 14% of its projected gross domestic product that year9. Brazil, India and the United States take a bottom-up approach. For example, Rede Asta, a network of more than 60 co-operative women’s groups across 10 Brazilian states, has created an online platform to support artisans who recover materials from waste. The EU is doing a bit of both. It has adopted binding targets on municipal waste. By 2030, member states must reuse and recycle at least 65% of waste and send no more than 10% to landfill. The goal is for all plastics to be reusable and for 75% of packaging to be recycled. EU platforms tackle food waste and finance the circular economy. 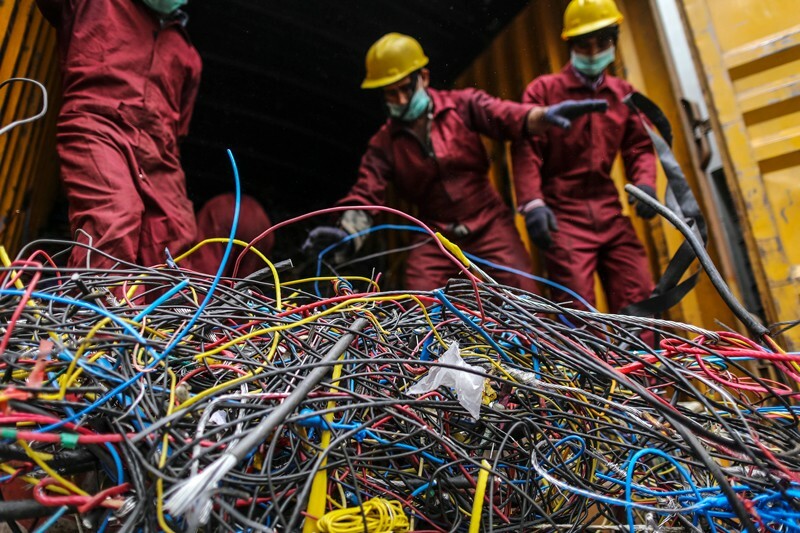 Regulations target electrical and electronic waste, scrap vehicles and batteries. The EU is also investing in regional innovations, such as supporting networks of companies that recycle clothing. Most of these circular-economy initiatives have saved materials, waste, energy and emissions. In Kawasaki, Japan, reusing industrial and municipal wastes in cement manufacturing has reduced greenhouse-gas emissions by about 15% (41,300 tonnes per year) since 2009, and saves 272,000 tonnes of virgin materials annually10. A typical Chinese industrial park, such as that in Liuzhou, Guangxi province, saves more than 2 million tonnes of CO2 emissions a year by using less energy and circulating materials11. The Slovenian city of Ljubljana now generates 41% less waste per head of population than the European average. In a 2018 Eurobarometer survey, 41% of small businesses and 53% of large companies across Europe reported having decreased production costs by following circular-economy principles; one-quarter said that they are designing products that are easier to maintain, repair or reuse. Nonetheless, circular-economy networks are too small. No international policy effort integrates circular-economy approaches. Yet these would contribute to many of the UN Sustainable Development Goals (SDGs), including those on water, energy, economic growth and climate change12 (SDGs 6, 7, 8 and 13). Some industries are starting to monitor material flows globally. For example, the aluminium sector uses a model of supplies of the metal, from mining to disposal (see ‘Global aluminium cycle’). The cement sustainability initiative uses its products and waste for energy production. In 2011, 24 cement companies in 100 countries reported having substituted 13% of their primary fuels with those derived from waste, reducing CO2 emissions by 17 million tonnes per year13. Accurate, traceable and secure data about the flows and stocks of most materials, and on the costs and efficiencies of industrial processes, are scarce. This makes it hard to generate projections and policies, and limits awareness of the benefits of the circular economy. For example, only a few eco-industrial parks and regions issue yearly reports on waste and recycling. Stocks in the built environment — for example, steel in buildings — and in other goods are not counted. Circular-economy concepts are more often celebrated than critiqued. Economic models have many gaps and rely on assumptions. For example, the costs of changing production processes, purchasing practices and organizational routines within a business are often taken to be low or zero. The impacts on extractive industries that would lose out, such as mining in certain countries, are not assessed. Projecting future market prices for raw materials and secondary resources is challenging. And policies can have unintended consequences. For example, incentivizing plastic recycling can generate more plastics: if lower prices increase demand, more plastic is needed to replace material that has degraded during recycling. Researchers need to collaborate more —with industry and non-profit organizations, as well as across disciplines from sociology and economics to engineering and science. The International Institute for Environmental Studies in Peterborough, Canada, which includes 19 universities and research institutes around the world, has set the circular economy as a priority area and supports collaborative PhD programmes. And the National Natural Science Foundation of China has invested in our work. But many other multilateral research organizations, such as Future Earth, have no programmes on the circular economy. Even those that are devoted to it, such as the Ellen MacArthur Foundation in Cowes, UK, are limited in their geographical scope. Community engagement is crucial. Consumers can drive producers to make changes and help to design solutions. Germany encouraged many households to transition to renewable energy in the 2000s by enabling them to connect their solar panels to the grid and receive payment for the electricity produced, along with incentivizing utility companies to purchase the electricity. Yet there is a lack of data on household and municipal consumption and recycling worldwide. Encouraging citizens to reuse materials can, perversely, limit access to resources in some parts of the world. Informal recycling networks are common in China and in many African nations. But scavenging waste removes it from formal networks that can process it more efficiently. As a result, materials become scarce and costs rise. Circular-economy principles would help organizations to hedge against volatility in the prices of commodities such as copper and rebalance flows of goods, scrap and used products. Currently, uneven trade balances result in empty trucks and shipping containers. These should be filled with waste materials such as cardboard, wood and metals, which can be returned to the producers. Global trade in waste is a good place to start. For example, China banned imports of most waste types in 2018, and Thailand plans to stop importing plastic waste from 2021. That material is now being sent to countries that have weaker waste regulations, such as Vietnam, Malaysia, Indonesia, Cambodia and the Philippines, where dumped plastics and electronics contaminate soil and water. An international covenant, as well as take-back approaches and policies, are needed for metals-based industries. A global strategy for the circular economy must include the following five steps. First, a global database should be set up to capture links between resource uses14. This should be run by international organizations such as the UN Environment Programme (UNEP) and the World Economic Forum, with support from national agencies. It should include indicators on flows of materials, water and energy, as well as information on stocks in the built environment, production costs and market trends. Gaps can be filled through case studies and modelling. Supportive nations such as China, Japan, Germany and the United Kingdom should provide initial funding for this, supplemented by industry. A modest fee might be levied on purchases of companies’ shares in stock exchanges, as happens in France. Exporters of raw materials might increase royalties on production and set up sovereign wealth funds to invest the surplus in supply-chain management and sustainable growth. This would build capabilities in a circular economy, leading to more diversified and resilient industries and economies. Second, a global platform should be established for sharing knowledge about the circular economy. The global Green Growth Knowledge Platform in Seoul is a good model. It was formed by the World Bank, UNEP and the Organisation for Economic Co-operation and Development to host information and share lessons on sustainable economic practices. Funding would come from countries with similar goals and from international organizations and companies that would benefit. Third, international alliances are needed to promote large-scale experimentation. These should develop governance and financial innovations for cities and sectors, especially water, energy, food, mobility and construction. Economies that rely on exporting raw materials, such as many in Africa, might need financial help from other resource-rich regions to transform. For example, Chile, Canada and Scandinavia are pioneers of eco-innovation among raw-materials exporters. Fourth, standards for performance measurement, reporting, accounting and future products need to be developed and harmonized. Key performance indicators should be derived through the International Organization for Standardization. These could be based on environmental and corporate social responsibility systems. Finally, policymakers should develop ways to enforce regulations, settle disputes and implement sanctions on a global scale. This should start with voluntary regulatory and reporting initiatives, kept in check through ‘naming and shaming’ by citizens, the media and non-governmental organizations. Ultimately, all of these efforts must cohere to form an international agreement on sustainable resource management, covering reporting, extraction sites, trade patterns and incentives. Andrew, R. M. Earth Syst. Sci. Data 10, 195–217 (2018). UN Environment Programme & International Resource Panel. Resource Efficiency: Potential and Economic Implications 291 (UNEP, 2017). Haas, W., Krausmann, F., Wiedenhofer, D. & Heinz, M. J. Indus. Ecol. 19, 765–777 (2015). US Department of Energy. U.S. Energy Requirements for Aluminum Production (DOE, 2007). Esposito, M., Tse, T. & Soufani, K. Thunderbird Int. Bus. Rev. 59, 9–14 (2017). Zabaniotou, A. J. Cleaner Prod. 177, 197–206 (2018). Organisation for Economic Co-operation and Development. 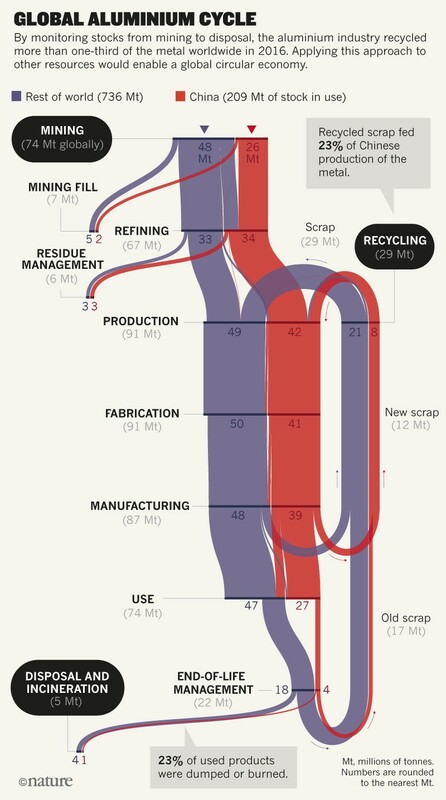 Improving Markets for Recycled Plastics (OECD, 2018). Liu, Z. et al. Renew. Sustain. Energy Rev. 91, 1162–1169 (2018). Ellen MacArthur Foundation. The Circular Economy Opportunity for Urban and Industrial Innovation in China (Ellen MacArthur Foundation, 2018). Hashimoto, S., Fujita, T., Geng, Y. & Nagasawa, E. Res. Conserv. Recycling 54, 704–710 (2010). Sun, L. et al. Res. Conserv. Recycling 119, 78–88 (2017). Schroeder, P., Anggraeni, K. & Weber, U. J. Indus. Ecol. https://doi.org/10.1111/jiec.12732 (2018). World Business Council for Sustainable Development & Cement Sustainability Initiative. The Cement Industry (WBCSD, 2014). Bleischwitz, R. et al. Nature Sustain. 1, 737–743 (2018).